On December 1, the Ohio House Commerce and Labor Committee held sponsor testimony on House Bill 377, Rep. Tom Brinkman's (R-Mt. Lookout) legislation that would impose "right-to-work" on private sector unions. "Right-to-work" laws prohibit collection of what's called fair share or agency fee - what is collected from non-members for contract enforcement - but forces unions to continue to represent non-members. These laws are designed to weaken unions. National AAUP and the Ohio Conference AAUP are opposed to "right-to-work." 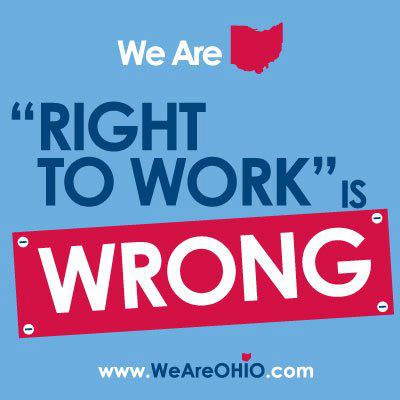 Union membe rs and others that know that "right-to-work" is wrong for Ohio packed three hearing rooms in the Ohio Statehouse for Brinkman's sponsor testimony. Democratic members of the committee asked Brinkman why he would want to pursue another divisive labor fight in Ohio when the voters already resoundingly spoke by repealing SB 5 in 2011. They also discredited several of the economic claims made by the sponsor. At this time, it is unclear whether additional hearings will be held, or whether a similar bill impacting public sector unions will be introduced. We conjecture that the only reason a public sector "right-to-work" bill hasn't been introduced is because the GOP is hopeful that the U.S. Supreme Court case of Friedrichs v. California Teachers Association will impose "right-to-work" on public sector unions. While HB 377 would not directly impact OCAAUP, we must remember that the private sector unions stood with us when we were under attack by SB 5. An attack on any piece of labor is an attack on all labor. Last week, House Bill 48 was referred to the Government Oversight and Reform Committee in the Ohio Senate. The General Assembly has adjourned for the year, but we expect hearings on this legislation to commence when they return in January. Your State Senator needs to hear from you about this bill, which would open the door for colleges and universities to allow handguns to be brought onto campus. Click here to be taken to the Action Network page through which you can contact the State Senator that represents you. When contacting legislators, we recommend that you use your personal e-mail address. Your institution may have a policy about using your .edu account in expressing views to government officials. In case you missed it, OCAAUP President John McNay wrote an op-ed that appeared in the Cincinnati Enquirer about why our organization opposes HB 48. We are seeking nominations for the 2016 Ohio Conference elections. In accordance with our governing documents, you must have been a member for two years and current on your dues to be eligible for a Trustee position. Nominations should be sent to Executive Director Sara Kilpatrick at sara@ocaaup.org and must be received by December 21, 2015. These are two-year terms that will commence on September 1, 2016. Trustees are expected to attend four quarterly, Saturday meetings each year in Columbus (one of these is the Annual Meeting). The President serves as a delegate to the National AAUP Annual Meeting and the Assembly of State Conferences (ASC) Annual Meeting. The Secretary serves as a delegate to the ASC Annual Meeting, as well. These events take place in Washington, DC in June. In addition, a special election will be held for the At-Large Member from either a private institution or a public institution with less than 100 members. That term will last one year. This position will be voted upon again in the 2017 elections for a full two-year term. The 2016 elections will be held in conjunction with the National AAUP elections. Serving on the OCAAUP Board of Trustees is a rewarding way to engage in statewide AAUP issues and state government advocacy. Any questions can be directed to Sara Kilpatrick at sara@ocaaup.org.